FKB46 is part of the 2018 Super Treasure Hunt set and 1/9 in the Checkmate series. It is Spectraflame black with blue details, checkered graphics, “King” on the sides, and black chess pieces. “TH” and the Hot Wheels logo and can be found on the rear sides. The muscle car has blue tinted windows, a chrome interior, black Real Rider wheels with silver trim, and a dark gray Malaysia base. 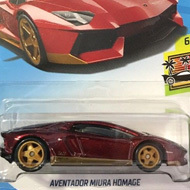 This vehicle can be found in mix “L” of 2018 Hot Wheels mainline cases. The King Kuda made its debut in 1970 as one of three chrome cars in the very first Hot Wheels Club.